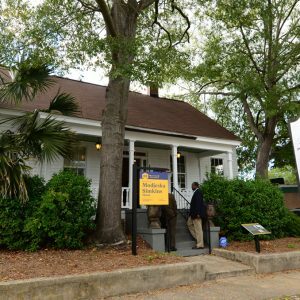 The Modjeska Monteith Simkins House, built between 1890 and 1895, is one-story Columbia Cottage and home to Modjeska Monteith Simkins, considered the matriarch of South Carolina’s Civil and Human Rights movement. Simkins was a founder of the S.C. Conference of the NAACP. As the secretary of the conference, Simkins hosted many meetings and planning sessions at her home forlocal and national civil rights leaders and NAACP lawyers, including Thurgood Marshall during the Brown v. Board of Education trial. Today, the site is operated as a house museum by Historic Columbia. The house is only available for private guided tours for groups of 10 or more with advance registration. To schedule a group tour, call (803) 252-1770 x 23 or email [email protected]org.